We’ve had to bring in reinforcements; Paul’s parents, Jean & John, were staying last week and earned their keep by knocking a few cabinets together. J & J are also keen campervanners and have just embarked on their second tour of NZ in a v posh 4-berth campervan. 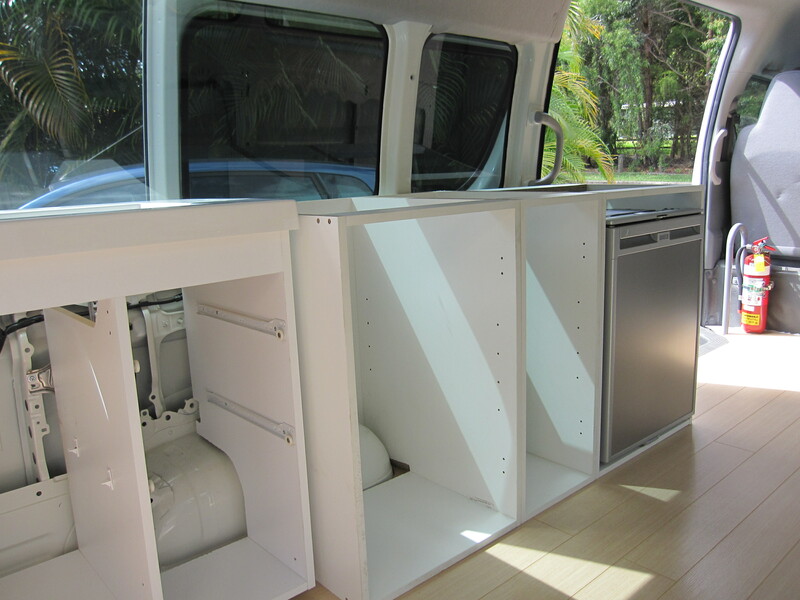 So the task last weekend was to build and fit the kitchen cabinets that will house the sink, gas stove and fridge. 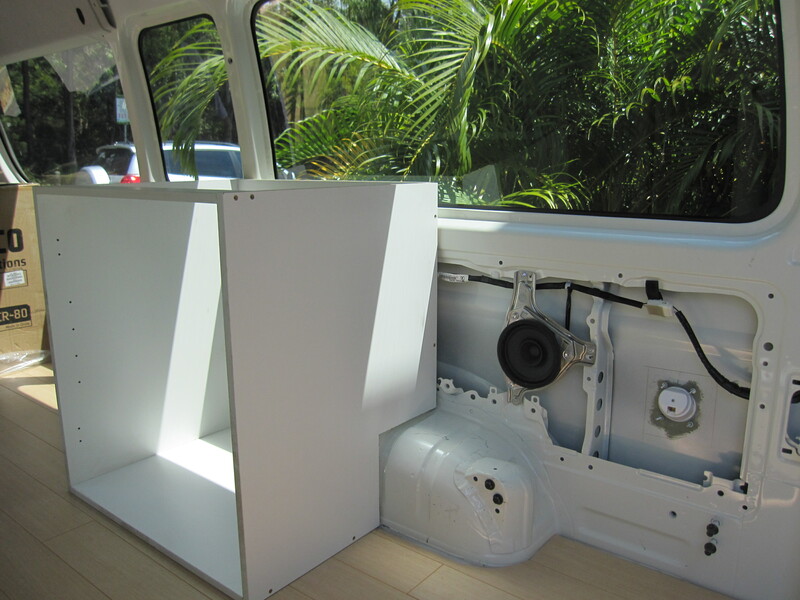 The ‘build’ part was made easier by buying ready-built cabinets from Bunnings! Well, they were flat-packed but still easier than just buying a load of wood. Amazingly they fit perfectly width-ways, so Paul just had to take some of the height off the bottom, and cut round all the wheel arches etc at the back. So from left to right is the bathroom basin, then there’ll be a wall, then the kitchen sink, then the fridge. The cabinet on the other side is for the gas stove and grill. The fridge is a Waeco CoolMatic (80 litres), which is bigger than we thought we could fit in, and has a little ice box at the top for our frozen peas. It’ll be wired in with 6mm cables to the 12volt battery and should last about 3 days before the battery needs to be recharged. That should be plenty long enough, as I can’t imagine we’ll ever go that long without plugging into power somewhere – not intentionally anyway, and if the worst comes to the worst, we’ll just have to have a couple of meals of warm beer and defrosted peas. The next job is to source and fit the two water tanks underneath the bathroom and kitchen sinks. Paul thinks he might be able to get them from a 4WD shop this week. He also wants to figure out the seating / bed combo; this has already prompted many colourful conversations between him and his Dad, as they both have very different ideas about how to build it. I think Paul is going to take advantage of J & J being in NZ for the next few weeks to make a start on it. 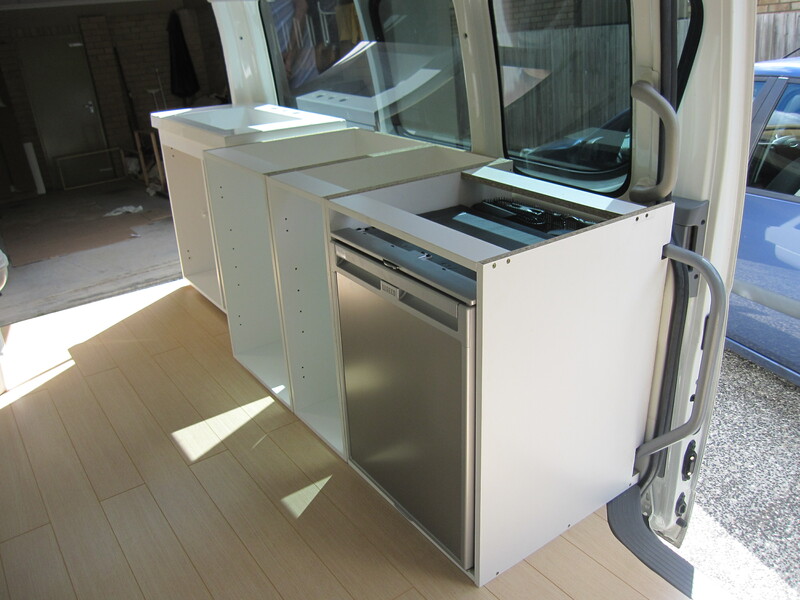 This entry was posted in Building a diy campervan, Campervan kitchen and cabinets and tagged campervan cabinets, Campervan conversion project, Campervan photos, Campervan supplies, Converting a campervan step-by-step, DIY campervan, in-laws by Rach. Bookmark the permalink. Great work by you both, especially the Project Manager (Rachel) getting Paul’s parents in on the work. That must have been a great efficiency too and cheap labour!!!! Looking forward to the next instalment now! When do you think it will be ready for a test run? and where will you take it?